In a pot, melt your butter over medium heat. Slowly whisk in the flour making a roux. Continue to cook over medium heat for 5 minutes, or until a nutty color and smell is achieved. Slowly whisk in the milk, stirring constantly to prevent lumps. Continue cooking over medium heat until the soup starts to thicken. 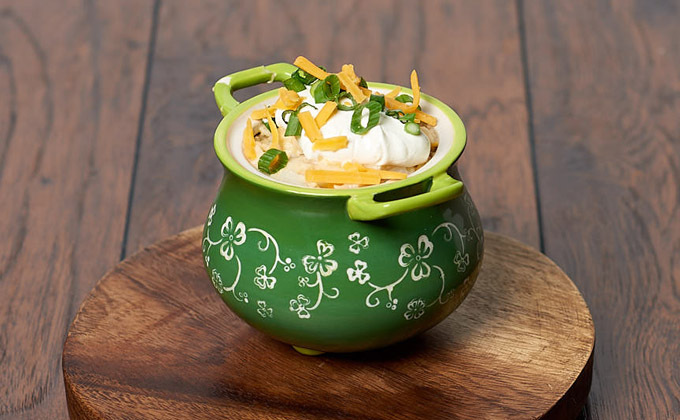 Pour soup into crocks and top with green onions & a dollop of sour cream.